Spain will hold a general election on 26 June, following the failure to form a government after the last general election in December. Francisco Camas-García draws on recent survey evidence to preview how the vote might go, how support for parties splits across demographic groups, and what the result might mean for the future of the Spanish party system. Spain will vote in its second general election in six months on 26 June, with the full knowledge that there is no going back from the new political era that began on 20 December at the last election. The move away from the traditional two party system, to one featuring four mainstream parties (PP, PSOE, Podemos, and Ciudadanos) is likely to be consolidated. This will provoke a progressive change in Spain’s political culture over the next few years: the farewell to an epoch of absolute majorities and the beginning of a new era involving pacts and coalitions. Spanish democracy has veered into uncharted waters, where the old compasses have completely lost their utility. It is a challenge of great magnitude for all citizens, but particularly for the political class. The two traditionally dominant parties (PP and PSOE) and the newcomers (Podemos and Ciudadanos) are doomed to live together and attempt to reach and implement their policies through an ongoing search for agreement with each other. The last vote estimation by Metroscopia just a week ago paints a very similar scenario to that of six months ago, but with a feature that could be decisive: a polarisation triggered by the positional inversion between PSOE and Podemos – who are running as an electoral alliance, Unidos Podemos, which includes the United Left and Equo. The PP is currently predicted to win the most support, with a better result compared to 2015 percentage wise; nonetheless, due to the characteristics of the Spanish electoral system, it would not be an improvement on their share of seats. This election, Unidos Podemos would be the second largest force with a better result both percentage and seat wise. PSOE would fall to the third position with a loss of congressional representatives. Ciudadanos would get a similar result. Since 2011, Spanish citizens have been showing, survey after survey, their discomfort with the two major parties. Today, there is no clear fear for the future nor yearning for the past. Citizen legitimisation of the new political situation stands at 76% according to surveys: that is to say, three out of four Spaniards believe that this new political situation is a positive development – that it is what Spain needs. A generational gap has been the primary driving force behind the transformation of the Spanish party system. The newcomers, Podemos and Ciudadanos, have quickly won support among young voters (especially those aged 18 to 34 years old). These parties would have three times the support of the PP-PSOE if only this age group voted. However, the PP and PSOE still lead on voting intention among those in older age groups (particularly the group over 65 years old). The generational cleavage is more acute on the left. The new coalition, Unidos Podemos, has a stronger body of young supporters than the socialist PSOE – to the extent that the former is twice as popular among people under 35. Nevertheless, Unidos Podemos barely collects electoral support among people over 65 years of age, for whom PSOE would still be the main political reference. Between the Popular Party and Ciudadanos, age-related differences appear less marked, albeit pointing in the same direction. It is not only a question of age, there is also a social fracture between an “active” society and a “passive” one. Those hit hardest by the economic crisis (those in precarious situations) like the unemployed or students, would probably show solid support for Unidos Podemos, who appeal in particular to the unemployed and students. Its electorate is also the most supportive of the multi-party system (endorsed by 93%). 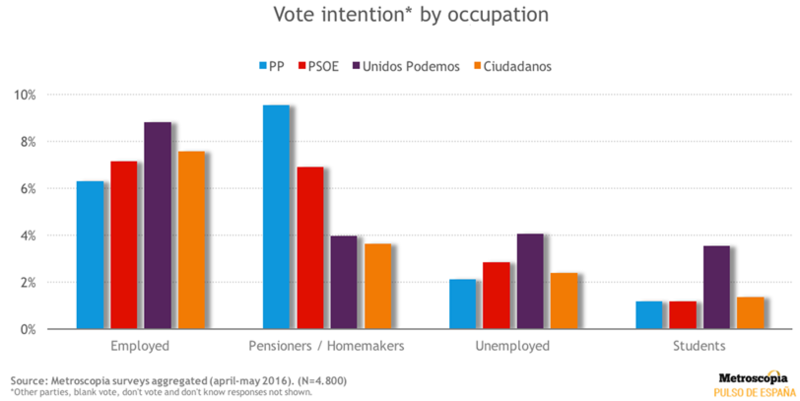 The PP and PSOE draw their support more prominently from pensioners and homemakers and those wary of the multi-party system and with low support for change (in this matter clearly more the PP than the PSOE). Ciudadanos draw a large share of their appeal from middle class employees, who are moderate ideologically, middle aged and highly-but-not-fully committed to the multiparty-system (30% back the two-party system). Overall, the multi-party system has an internal dynamic that is more subtle and complex than the simple “winner takes all” two-party system. Thus, Spain will have to get used to a model that requires more flexibility in terms of the governments that emerge from elections. Right now, according to surveys, citizens are divided into two camps depending on their preferences for the post-electoral scenario. 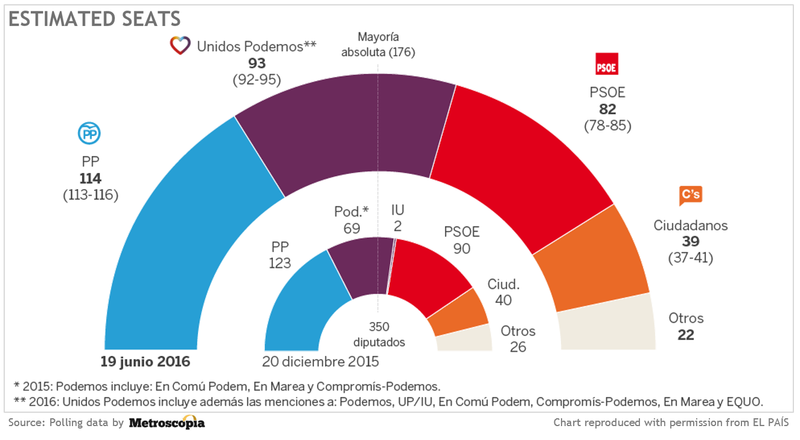 If there were only two possible coalitions organised around formations considered more ideologically extreme (PP and Unidos Podemos), half of the citizens would choose a coalition between PSOE and Unidos Podemos (48%) and the other half a coalition between the PP and Ciudadanos (42%). Although, more than 70% of the citizenry prefers that the party for which they vote for would be free to choose the most convenient coalition. The electorate ends up giving, at the end of the day, ample leeway for parties to decide. This article is a result of Metroscopia teamwork composed by: José Juan Toharia (president), José Pablo Ferrándiz (main researcher), Marcos Sanz (analyst) and Manuela Uribe (intern). Francisco Camas-García is an Analyst at Metroscopia.